This event is open to the public! 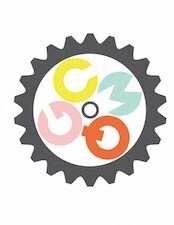 Join us on January 5th in Room 327 at the Lexington Community Center from 9am to 4:45pm for some social sewing. We will have a charity sewing project opportunity for those who are interested or you are welcome to work on personal projects. Visit our Meetings and Gatherings page for more info. Looking forward to quilting/knitting/hand sewing with you! Here is a striking piece in both color and size by Chris. 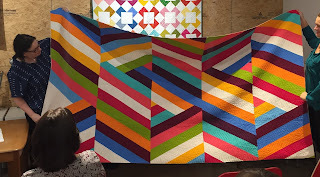 After all of Charlotte’s efforts at our winter retreat, it’s great to see her dramatic finished quilt. This is Hildy’s first venture into a quilt-as-you-go project- she send thanks for people’s input. 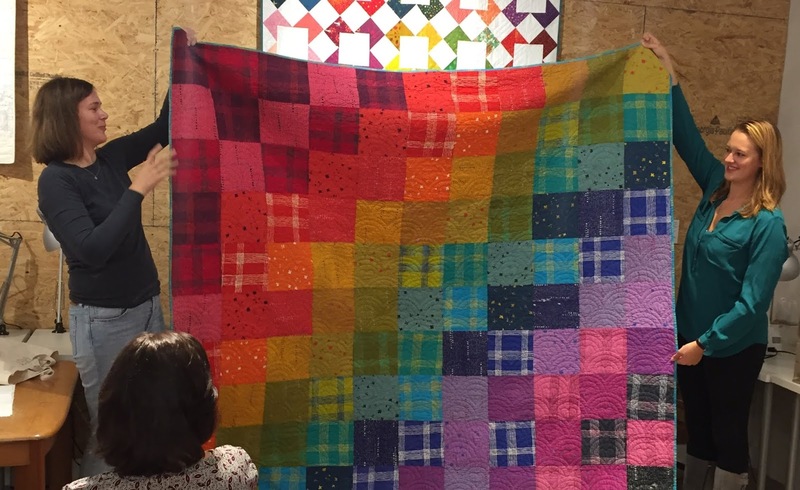 Joy has made a quilt for her four-year-old daughter that is big enough to grow into! 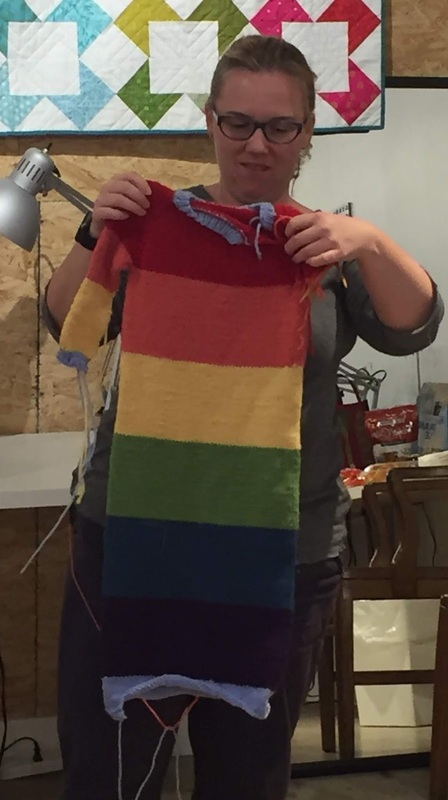 And finally, a rainbow-striped, extra-long sweater knit by Stephanie. If you've been to one of our meetings lately then you know we are putting some Polaroid quilt blocks together for our next block of the "month". In honor of the lovely crafty lady who brought us this pattern, we have our next installment of Meet Your "Quilt" Maker. I’ve been listening to Lotta Sea Lice by Courtney Barnett and Kurt Weill a lot, along with Stevie Wonder and Solange. Also Radiolab podcast. I want to go back to curves again, like a drunkard’s path or muffin top. 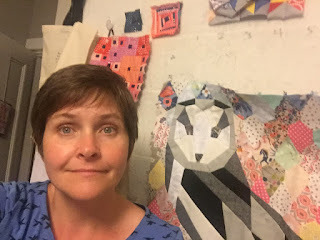 My first and only Drunkard’s Path quilt languished for 3 or 4 years because I thought I had made too many mistakes--the other skill to work on is focusing on what is right in my quilts instead of my eye drifting to the mistakes. Figuring out how to add hand embroidery to my quilts is something that took a lot of trial and error, I like doing a little customization or a small message in the quilts for people I care about. What an interesting idea. Much of why I sew has to do with getting to work on what I want, when I want to without having to get agreement from other people (which is what I do a lot of in my work managing projects). Prints! I love prints, my eyes are naturally drawn especially to black and white prints (dots, stripes, shapes, repetitive images of any time, you name it). Much of what I’m looking at lately has been Cotton + Steel. I also love Carolyn Friedlander fabrics too. Anything architectural or pop art inspired really sings out to me. 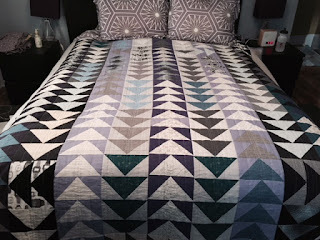 The quilt that we have on our bed most of the year, which is a Modern Flying Geese pattern from Red Pepper Quilts. This was the first quilt I made on my own without taking a class. I like adding a little bit of randomness, so I was able to turn a few of the blocks sideways and it makes me really happy. About eight years ago. I grew up crocheting and making clothes for dolls because my parents were always DIY-ing things. My mom got into quilting when she retired, so I followed along. My favorite part is finding something I can do with the design or fabric choices that relates to the person i’m making it for. Next in my list is the Up North Pattern by Pen + Paper patterns, I want to add a dog and turn the camper van into a horse trailer for my aunt who loves collies and has horses. Set it aside and move on to something else like improv log cabin squares. If things are looking too matchy, my husband sometimes gives me a second opinion to rearrange the blocks a little bit. I knit, sew bags and clothes, embroider, and I do a lot of cooking. Trina’s Starlite Lounge, All-Star Pizza bar and Flour have the veggie options I need. Quiltcon mini quilt swap last Feb. I'm a scorpio and my preferred mode of travel is by bike. Christine is showing us samples of the November lottery block - a Polaroid pattern. 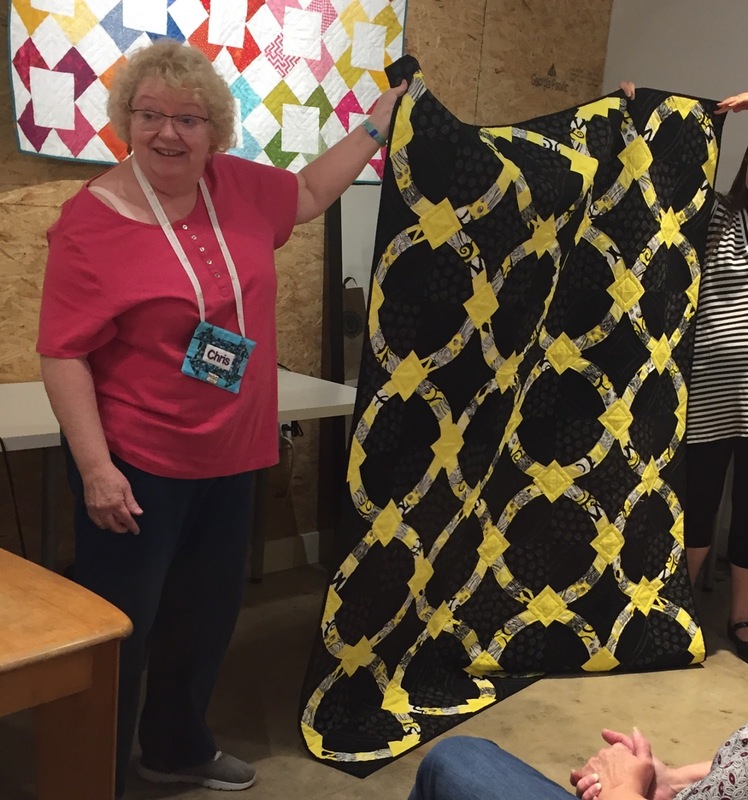 Julie very proudly shows of her finished quilt consisting of colorful circles and pie wedges. Here are four more Blocks of the Month that Sue has finished so far. 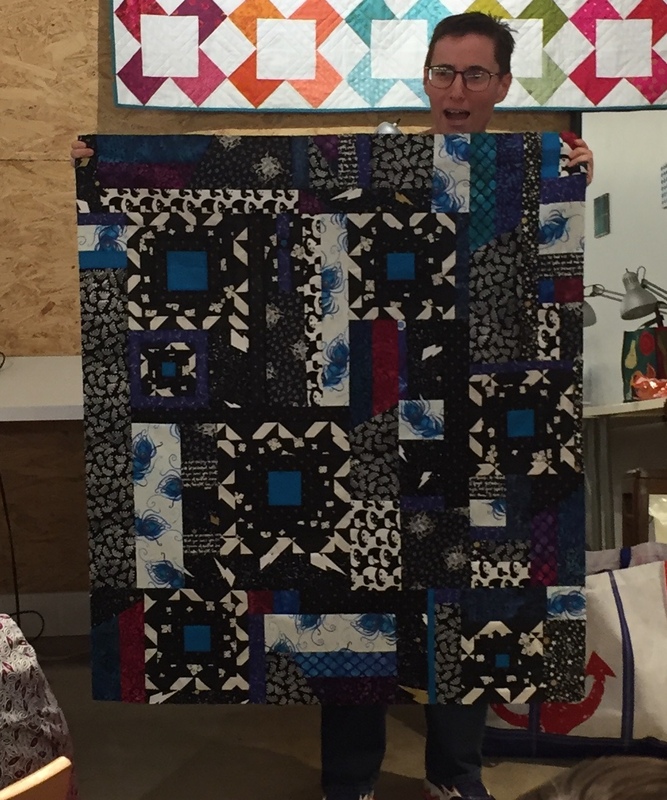 Heather has completely assembled the quilt top whose design consists of lots of sewing accouterments. 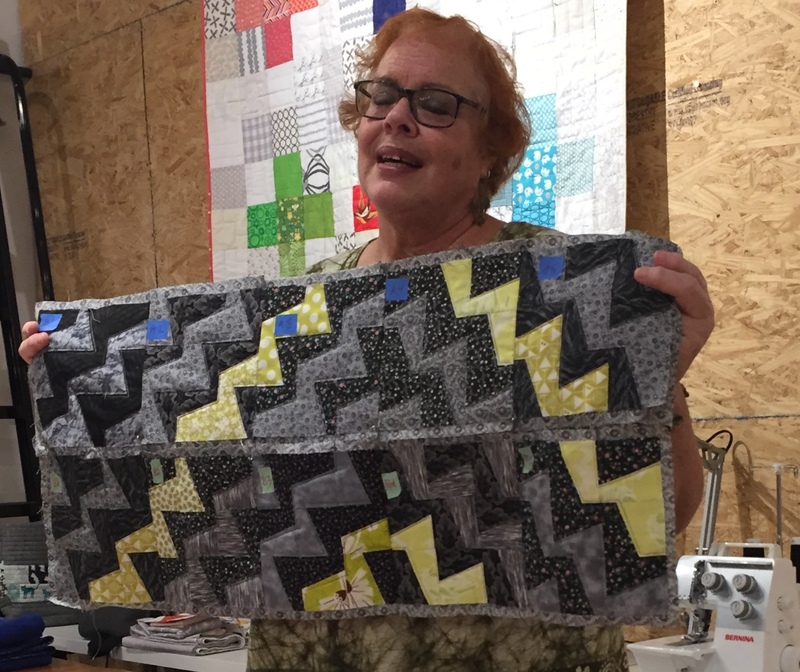 Jen displays a piece based on the idea of a “windy” block. Not sure what the original looks like, but a truly interesting result! Regina is peeking out from behind her newly finished honey bee block quilt, finished by her mom. Sandy explained how she made this fabulous quilt inspired by the art of Ernst Haeckel. Here is Christine again with a piece based on a design by Carolyn Friedlander. Jordan has made multiple blocks from the Quilt Block Cook Book and is showing two of his favorites. An invisible Gwen is holding up a dramatic blue and white Ohio Star. Here is a table runner that Reva has created just in time for Rosh Hashanah. 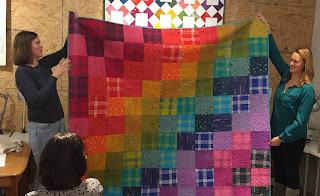 Allison shows off a very “positive” and colorful quilt. Maritza displays a dramatic triangle and strip creation that may or may not be an octagon when finished. A group effort putting together our charity quilt submission to QuiltCon 2109. We were a few blocks shy to complete the quilt, so its designer, Abigail, jumped into action to make a few more squares. With this block, you’ll create “Polaroid” photo block to showcase interesting prints, fussy cut images, charm squares or tiny piecing in a photo style frame. Each Polaroid gets a gray outer frame, and the finished block illustrates 4 interesting Polaroid images. Colors: All of the “picture” centers of your Polaroids should include dark/navy Blue. The images don’t have to be entirely blue, but a common thread of one color will tie the finished lottery blocks together. The four Polaroid blocks that you sew together should relate to one another visually or thematically. Note: Is OK if one or more individual Polaroid centers are set wonky as you trim. The images are the star and wonkiness can help blocks made by different people go together for the lottery winner. SOCIAL SEW IN ANNOUNCEMENT! Sept 29th at the Lexington Community Center! This event is open to the public! Join us on September 29th in Room 327 at the Lexington Community Center from 9am to 4:45pm for some social sewing. Visit our Meetings and Gatherings page for more info. Looking forward to sewing with you!